I haven't finished the second sock of the pair that I showed you yesterday, but I thought I'd post the pattern anyway. I'm working on a sample knit for another blogger, and I've got a deadline, so the second sock is on hold for now. I'm calling the new pattern "Ampersand". It is named for Ampersand Mountain in the Adirondacks. Some of my best memories are of the summer vacations my family took to Saranac Lake in my carefree college days and the years just after graduation. None of us would ever miss it. We'd bring our friends, boyfriends, or husbands. We would laze around on the dock reading, float in tubes on Upper Saranac Lake, windsurf, canoe and hike the surrounding mountains enjoying good company, and my mother's always impressive spread of food! I'm feeling a little nostalgic for those days lately. So I will pay tribute with the sock pattern. Ampersand is knit from the top down on two circular needles. 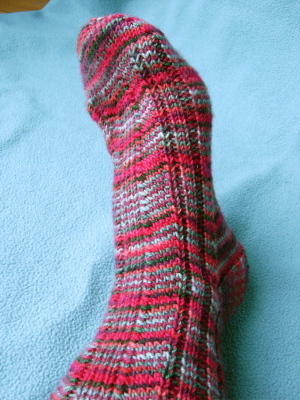 I used Socks That Rock medium weight, in the Jingle Bell Rock colorway. As always with my patterns, if you find any errors, please let me know so that I can adjust the pattern. You will find the pattern in the sidebar. I hope you like it. I've been meaning to show you this gorgeous roving that I got from Susie at Perchance to Knit . Isn't it pretty? My spinning skills aren't up to this yet. I think I'll save it until I can spin it well. For now, I'm enjoying looking at it. Oh my, I just checked out Susie's etsy shop to create the link. She's added some delicious new stuff. You'd better go have a peek. That's a terrific sock pattern. Thanks for sharing it. Thank you for taking the time and effort to make this wonderful PDF pattern Kirsten!The socks are beautiful! These socks are wonderful! I wish I'd not been so impatient to make Christmas socks, Jingle Bell Rock looks great in this pattern. 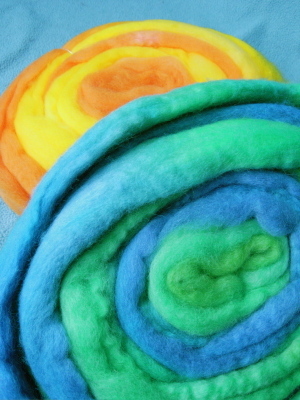 oh my gosh - the colors on that roving are AMAZING!!!!! Thanks! I downloaded the sock pattern, and hopefully I'll be able to knit it soon. :) It looks great! Thank you for sharing the pattern for those socks! It's lovely and a great way to show off STR colors! I have some STR in the stash that would love to be knit up in Ampersand! Brace yourself for a slew of dumb questions! Very nice -- I like how it moves the colours around. Thanks for sharing the pattern! I can't wait to check out your pattern thanks so much for sharing! It's great that you shared the story behind the name. Now when I knit them and wear them I can imagine my feet on vacation! Perchance to Knit has beautiful stuff. I have knit with her sock yarn and it is delicious! I love how the varigated yarn looks in your pattern. I'm always on the lookout for sock patterns that show off beautiful yarn like that. Thanks!! Ohh, love the new sock! Thanks for the pattern. Thanks for sharing the pattern. It looks like a great one for variegated yarns. Love the pattern! I spent many summers upstate, and one summer we did a weeklong canoe trip through the Saranac Lakes. Gorgeous. I keep thinking I should go back with my family, but I know it wouldn't be the same, but I should give them a taste of New York wilderness! I love the sock!! And I'm just going to have to try out the Ampersand pattern. Thanks!